The avalanche danger is generally LOW in the Alpine. Isolated pockets of old wind slab could be triggered in steep higher elevation terrain. 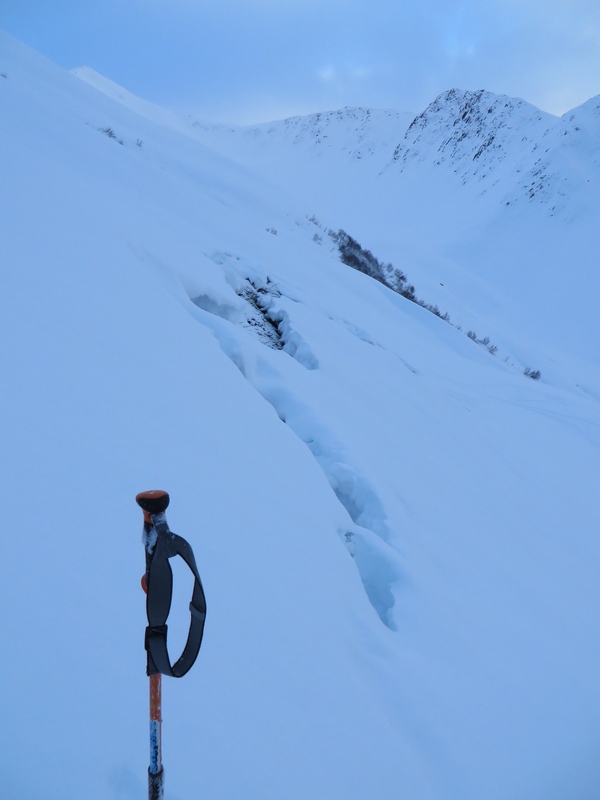 In steep terrain over 3,500’ be on the lookout for previously wind loaded pockets of slab 1-2' deep. In this terrain the danger is MODERATE today. At treeline the danger is LOW, where a once saturated snowpack has now mostly refrozen. Avalanches in this zone are unlikely with glide avalanches being the exception. Early season conditions exist in the treeline elevations (1,000’-2,500’). You will encounter icy conditions along well traveled routes, exposed rocks & stumps and open water. Use caution when traveling through this elevation band. Mark you calendars for January 23rd when the APU Outdoor Studies Department and Alaska Avalanche School present Winter Wildlands Alliance’s Backcountry Film Festival!! A night of entertainment, raffle prizes and a chance to rekindle our winter stoke is on tap. This is an AAS and F-CNFAIC fundraiser - a great way to support local avalanche education and information. Hope to see you there! For those willing to endure challenging approaches into the Alpine, favorable skiing and riding conditions exist. The main avalanche concerns to contend with today will be isolated pockets of older wind slab and glide cracks/avalanches. Winds that ended 3 days ago (Jan 16th) loaded some starting zones in the upper elevations. These slabs range from 1-2 feet in depth. It will take slope angles approaching 40 degrees to find slabs that could be triggered by skiers and riders today. This is an isolated problem but is worth keeping in mind if you are heading into high elevation steep terrain or to the periphery of the forecast area where we have less information (Girdwood & Summit Lake). Glide cracks are visible throughout the area. Most cracks exist between 2,500-3,000’. No releases were observed over the past 24 hours. These avalanches can move downhill at any time and do not play by the normal rules of avalanche release. Steer clear of glides and alter your route if you find yourself below these cracks, as my partner and I did yesterday on our way up to Magnum Ridge. Travel one at a time on suspect slopes. Recognize and utilize islands of safety for spotting and regrouping. Have an escape route planned in the event of an avalanche. Communicate decisions and plans effectviely within your group. Be aware of and minimize exposure of other groups that are above or below you. Yesterday brought mostly clear skies with no precipitation. Winds were light out of the Northwest and temperatures were more seasonable, with ridgetops averaging in the low 20s F.
Today expect similar conditions with occasional snow showers lasting into the evening hours. Expect a trace to 2” of snow by tomorrow as a short wave disturbance moves through the area. Winds today will be light out of the East at 5-10mph. Temps at 1,000’ will be around 30 F.
Beyond tonight potential for snow will next come on Thursday. Temperatures look to remain closer to normal over the next few days.